Activated carbon filter removes odors. This is a 3Q Filter. It is important to only use 3Q replacement parts to maintain product performance and warranty. * Note: Please remove the plastic bags of the True HEPA filter, Charcoal filter, and Activated carbon filter before installing the replacement filters. The filters' lifetime is based to your room air quality and using time. 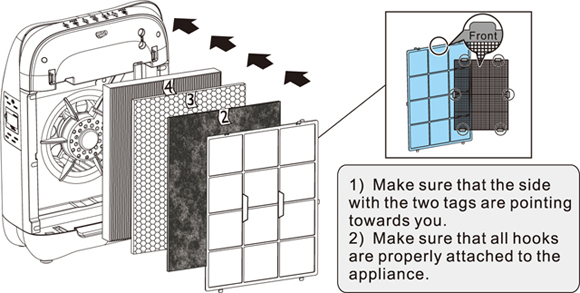 Using the appliance in a humid environment will reduce the lifetime of activated carbon filter and HEPA filter. Charcoal filter: Every 3 months. Activated carbon filter: Every 6 months. 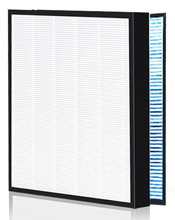 True HEPA filter with Anti-bacterial treatment: Every 6 months. Click the button below to add the True HEPA Replacement Filter Set for 3Q - AP-300H Air Purifier to your wish list.